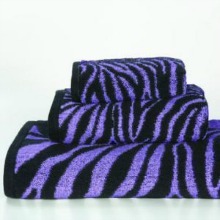 Bright and absorbent 3pc Towel Set in purple Zebra print. Available in Blue, Green and Purple. Set Iincludes one bath, one hand and one washcloth towel.